Years ago, when I was just starting to learn about quilts, I visited an antique shop owned by an established dealer who had a large inventory of high-end quilts. The dealer, who had a good idea about what I liked, wasn’t there that day, but a young, knowledgeable assistant was. I asked to see something really unusual, and the assistant pulled out a very old Broderie Perse crib quilt. I had no idea how rare and significant it was. I just knew what I liked, and my reaction was, “Too girly.” It was a shocking thing to say, I know, but in those days my criteria had more to do with décor than history. I had en eye for antiques, art, and color, but I hadn’t developed an eye for quilts. Getting back to Shelly’s question, how to develop an eye for quilts, it comes from looking at a lot of quilts. More than ten years ago, I discovered eBay, and found myself looking at thousands of pictures of quilts each week. The information about quilts wasn’t always reliable, but I was free to develop my own criteria. The quilts I liked were the ones I didn’t see every day. Each week, there was a sea of Depression Era quilts, so I veered away from those most of the time. If it was a Grandmother’s Flower Garden, Double Wedding Ring or Sunbonnet Sue, I didn’t want it. Besides, the pastel colors were a little soft for my décor. “Too girly.” I wanted bold, graphic, and dare I say “masculine” quilts – whatever that is! If it was rare, I wanted it even more. Even though I was looking at thousands of quilts each week, I didn’t really start learning about quilts until I began hanging around with quiltmakers and quilt historians. Not only were they looking at quilts, they were able to culturally and historically contextualize them. 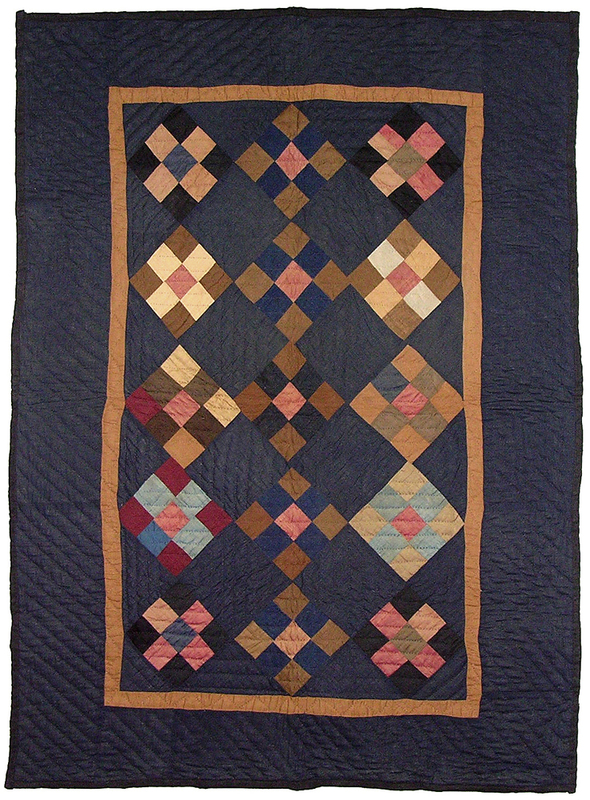 Before getting to know more historians and quiltmakers, I was looking at quilts only as works of art. 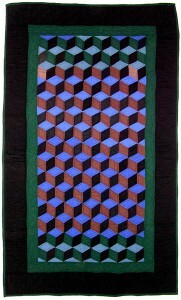 "Tumbling Blocks" QuiltMade in the 1940s by Lidian Hostetler of Wayne County, Ohio. Quilt historians changed how I look at quilts. Fabric and pattern identification, regionalism, and the effect of industry and the mass media on our tradition, are all things I’ve learned from historians. It was as easy as joining the local quilt study group and the American Quilt Study Group. All I had to do from there was sit back and enjoy the steady stream of quilts, and the well-informed discussions about them. Quiltmakers have also changed how I look at quilts. They taught me how to look at construction, methods of finishing, and to consider ideas that could connect quilts to the people who made them. I love bringing old quilts to the local guild for show and tell. The reactions tell me a lot about what it might have been like to make each quilt. If the quiltmakers roll their eyes, it’s probably novice level. If their mouths are hanging open, it’s mind-boggling. 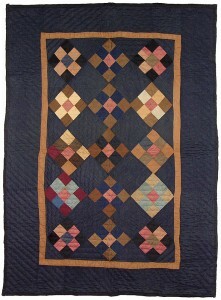 "Nine Patch" QuiltMade around 1900 in Ohio and was once part of the Esprit collection. I was constantly looking and learning, and already had my own set of rules about what I would or wouldn’t buy. Around the same time as my visit to the antique dealer with the Broderie Perse crib quilt, I acquired two Ohio Amish crib quilts through eBay. Both had been part of the Esprit Collection. One is a small Nine-Patch made around 1900, and the other is a Tumbling Blocks made by Lidian Hostetler of Wayne County, Ohio in the 1940s. These quilts seemed like something out of the ordinary, since most of the Esprit quilts were large, bed-sized quilts. They were rare, but I didn’t know just how rare until I shared them with the experts. Once again, the reactions said it all. Eyes popping, jaws on the floor, and audible gasps. When I brought the Nine-Patch to Paducah last year, as soon as the quilt hit the table, everyone flocked around to get a better look it. They were magnetically drawn to it. You just don’t see quilts like that every day. As it turned out, it may have been dumb luck that I didn’t want the Broderis Perse crib quilt. It was later reclassified as a fragment cut from a larger quilt, but I didn’t have the eye to realize it. I also didn’t know enough to ask if it had, indeed, been made as a crib quilt. Today, I would absolutely love to have an authentic Broderie Perse crib quilt. I don’t think of Broderie Perse as “too girly” anymore. But I wouldn’t want it unless it originated as a crib quilt. Maybe I had a good eye after all. Photos courtesy of Bill Volckening. A great website! I’m a collector myself and I have certain things that “turn me on” with quilts. It is always interesting to see what other collecters look for in an antique quilt. Keep the good info coming.